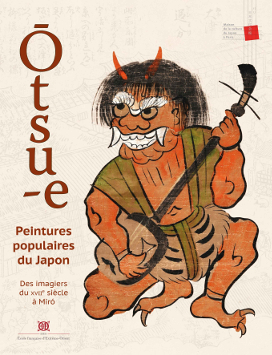 The MJCP and the EFEO organize a seminar "L’imagerie populaire d’Ôtsu : un art oublié du Japon d'Edo" on the occasion of the opening of the exhibition "Ôtsu-e : peintures populaires du Japon" which the EFEO also publishes the catalog. Seminar open to the public. Free registration required via the ticket office of the site. Invited by the Centre of Seoul, Dr. Vadim Akulenko, assistant at the department of Korean studies of the Institute of Oriental Studies, School of Regional and International Studies, Far Eastern Federal University, Vladivostok, makes a presentation: Evolution of Understanding Minjok in the DPRK. Aiming to support the training of a new generation of Old Javanese philologists and to stimulate international collaboration in this field, the École française d'Extrême-Orient (French School of Asian Studies, EFEO) and the National Library of the Republic of Indonesia (Perpusnas), with support from the École Pratique des Hautes Études (Paris), founding member of PSL Research University (Paris), will co-organize this year, for the fifth time, an international intensive course in Old Javanese. The course will take place from 21 July through 3 August 2019 at Yogyakarta, Indonesia. The deadline for submitting an application is set to the 14th of April 2019. On the 18th of March, on the sidelines of the section on pre-Angkorian inscriptions supplemented for the occasion by new presentations, the National Museum of Cambodia proposes a "focus" on the inscribed jamb (K.127) engraved with the date 604 of the śaka era (ie 682 AD), with the first known graphical representation of the zero in Khmer country. The program Corpus of the Khmer Inscriptions (CIK) of the EFEO contributed a lot to the writing of the notes. Arlo Griffiths (EFEO), Emmanuel Francis (UMR CEIAS, CNRS-EHESS) and Annette Schmiedchen (Humboldt University of Berlin), with the participation of Florinda de Simini (L'Orientale University of Naples) are laureates of the call for projects of the European research council (ERC) synergy grant 2018 for the research project DHARMA : The Domestication of “Hindu” Asceticism and the Religious Making of South and Southeast Asia. As part of the official visit of the French Prime Minister to Vietnam, the director of the EFEO, Christophe Marquet, signed on November 3, 2018 in Hanoi three scientific cooperation conventions with the Vietnam Academy of Social Sciences, the Vietnam Institute of Archeology and the Institute of Social Sciences Information. 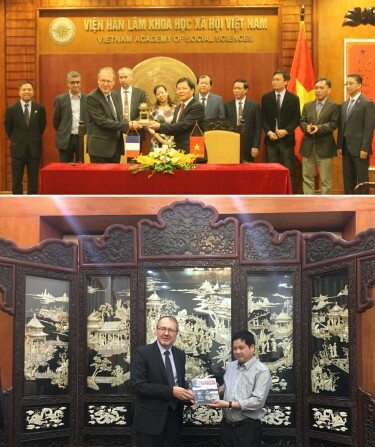 He was also received by the director of the National Museum of Vietnamese History, the former Musée Louis Finot founded by the EFEO in 1932, and by the director of the Hanoi Citadel Museum (Imperial City of Thang Long) whose museum project has been coordinated by the EFEO in 2010. The library will be exceptionally closed on Friday, November 2 (next day of All Saints' Day, public holiday). The International Conference Sovereignty and imperial patronage in China (XIIIth-XXth century), organized by Luca Gabbiani (EFEO, UMR 8173-CCJ), Marianne Bujard (EPHE) and Luo Wenhua (National Palace Museum Research Center for Tibetan Buddhism Heritage), is held at Peking, from October, 25th to 27th, 2018.